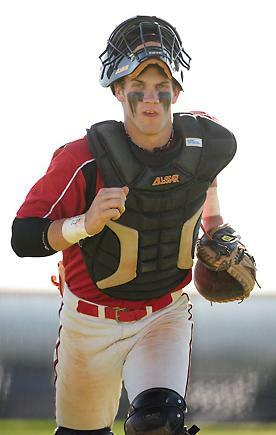 Power hitting phenom, Bryce Harper, will be the number one pick by the Nats at Monday's amateur draft. The 17-year-old took an interesting path to the draft by exploiting a loophole. Harper dropped out of high school, got his G.E.D. and enrolled in a junior college. MLB happens to let JUCO kids into the draft after just one season. A smart move in Harper's case. But I did question how many delusional parents will follow The Harper Path. Harper goes to school. Harper enrolled at the College of Southern Nevada for the sole purpose of mashing homeruns for the Prostitute Killers [ed.-may not actually be CSN's mascot, little research was done]. And Harper mashed away to the tune of 29 hrs and .442/.524/.986. During the JUCO World Series he managed to go 6-7 and hit for the cycle, only to go 6-6 the next day with 4 homeruns. A similar feat to what I accomplished in the magical summer of '92. Sure, some will say I had a short porch in left in my backyard or that I filled my Wiffle Ball bat with sand, but you'll never take it away from me! Harper giveth, Harper taketh away. In the 5th inning of Southern Nevada's JUCO World Series game, Harper was called out on strikes. Harper drew a line in the dirt, presumambly to show the umpire where he thought the pitch was. The umpire immediately ejected him, presumably so the world would know the name Don Gilmore. And you shall know my name is Don Gilmore when I eject Baseball Jesus with the toss of a finger. Surprisingly, the Harperless team would go on to lose that game. Since it was Harper's second ejection of the season, he was suspended for two games. Southern Nevada would get knocked out of the tourney the next day. Harper's Bad Attitude. Of course, now there are some scouts that question Bryce Harper's makeup and have labeled him a hot-head. Obviously, none of that will cost him the top slot in the draft, the kid absolutely rakes. But I think it's interesting. The kid, from all accounts, received the ball well this season and Jim Callis called him the greatest power hitting prospect of all time in a recent chat. Are some scouts just looking for something bad to pin on him? Bryce Harper was on the cover of SI at 16. In the new era of Twitter and the Internet of every phone, he's getting to be more hyped than LeBron James was when he came out of high school. Yeah, the kid has some growing up to do. Let's see if we can allow him to do it. If I had had all of that press by 17, my head would have exploded. And I would have quit baseball due to all of the, um, let's call it, female attention. Bryce Harper gets rich Monday. Harper will get drafted first overall by the Washington Nationals on Monday. He will be the second consecutive, Boras represented, once-in-a-lifetime prospect the Nationals drafted. They drafted Strasburg last year in case you don't watch baseball or have the Internet. In which case, you're not exactly our target audience. Harper will likely sign the day before the deadline for somewhere between Mark Teixeira's $9.5 million deal and Strasburg's $15.67 million deal from last year. Boras will obviously push for a record breaking deal because he doesn't have enough money yet to build his TIE Fighter to fight George Lucas in space. Either way, Harper will be one rich kid. As strange as it sounds, he will join a promising Washington Nationals franchise. Nah, they'll screw it up. Riggleman'd.